Some 7,600 years ago, human civilization in Southeastern Europe suddenly came to a halt. New research sought answers as to why this happened, and the findings paint a stark reminder of the toll rising seas can inflict on our society. The Neolithic revolution was the first major transformation humanity had paused — the transition foraging to farming. Spreading out from the Middle East, this wave of change took peoples used to hunt and forage wherever they pleased and tied them down, hoe in hand, to sedentary — but oh so lucrative — farms and fields. Around 7,600 years ago, however, the revolution paused — no new agricultural settlements seemed to pop up in Southeastern Europe around the time, existing communities declined, and the progress of civilization as a whole came to a standstill. Up until now, we didn’t have any inkling as to why this happened, but new research from the Senckenberg Biodiversity and Climate Research Centre, the Goethe University in Frankfurt, and the University of Toronto sheds some light on this mysterious period. According to their findings, this lull in progress was due to an abrupt rise in sea levels in the northern Aegean Sea. Evidence of this event was calcified in the fossils of tiny marine algae preserved in seafloor sediments. The impact this event had on societal dynamics and overall development during the time highlights the potential economic and social threats posed by sea level rise in the future, the team says. Given that climate-change-associated changes in sea level are virtually unavoidable, the team hopes their findings will help us better prepare for the flooding ahead. “Approximately 7,600 years ago, the sea level must have risen abruptly in the Mediterranean regions bordering Southeastern Europe. The northern Aegean, the Marmara Sea and the Black Sea recorded an increase of more than one meter. This led to the flooding of low-lying coastal areas that would have been ideal areas for settlement,” says lead author Professor Dr. Jens Herrle. The findings are based on a sediment core retrieved from the sea floor of the northern Aegean Sea. Herrle and his team used this core to reconstruct salinity levels in this part of the Mediterranean from 11,000 and 5,000 years ago. 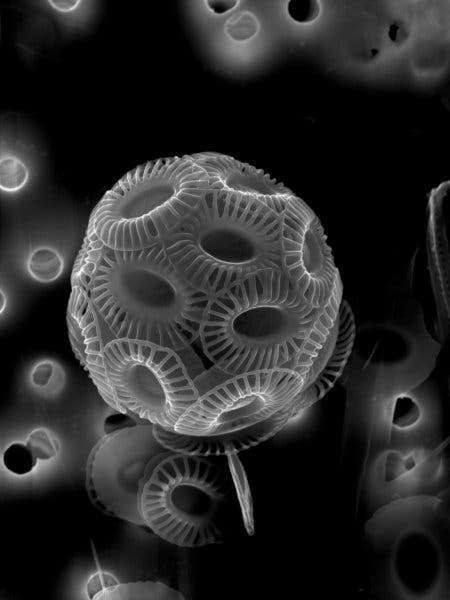 However, the core was also rich in tiny, calcified fossils of Emiliania huxleyi, a coccolithophore (a species of photosynthesizing plankton that’s ubiquitous even today). Analyzing them under a scanning electric microscope, the team observed significant size changes in these algae — which indicate a change in the salinity of surface water in the Aegean during their lifetime. “These calcifying algae evidence two rapid decreases in the salt content, at approximately 8,400 and again 7,600 years ago, which can only be explained by the fact that a higher volume of low-saline surface water flowed from the Black Sea into the northern Aegean at these times,” Herrle explains. The evidence supports a link between the two timeouts in the Neolithic revolution and the flooding events. The event 8,400 years ago coincides with archaeological findings suggesting that settlements in low-lying areas were under significant hardship from encroaching seas and other associated climatic changes. The renewed rise just 800 years later likely amplified these communities’ woes, keeping them from making the transition to agriculture. Past fluctuations in sea levels have already had a significant effect on human history during the early days of agriculture, the authors note, warning that it would be unwise to dismiss the challenges it will place in our path in the future. The paper “Black Sea outflow response to Holocene meltwater events” has been published in the journal Scientific Reports.